Western Michigan QB Jon Wassink and Ball State signal-caller Riley Neal are out for Tuesday night's MAC game in Muncie but the total is still creeping up. Western Michigan QB Jon Wassink and Ball State signal-caller Riley Neal are out for Tuesday night's MAC game in Muncie but the total is still creeping up. With both teams allowing 45 or more points their last two games, the total has moved from 54.5 to 57 at the Westgate LV SuperBook with 71 percent of tickets in the market on the OVER, according to Sports Insights. Western Michigan will turn to freshman quarterback Kaleb Eleby for a third consecutive game. Eleby is completing just over 70 percent of his passes for 445 yards and three touchdowns but seven team turnovers the past two games hasn't allowed for Eleby nor RB LeVante Bellamy (6.5 yards per carry) to get any rhythm. __MORE:__ [College football Week 12 betting lines](https://www.betchicago.com/college-football-week-12-betting-lines-ian-book-notre-dame) The good news for the Mustangs as they look to sneak into the MAC title game, is Ball State has the fifth-worst defense in the nation in success rate and eighth-worst in stuff rate against the run. The Broncos are 25th in offensive stuff rate and should be able to control the line of scrimmage and time of possession in Tuesday's game as long as they can avoid turning the ball over. 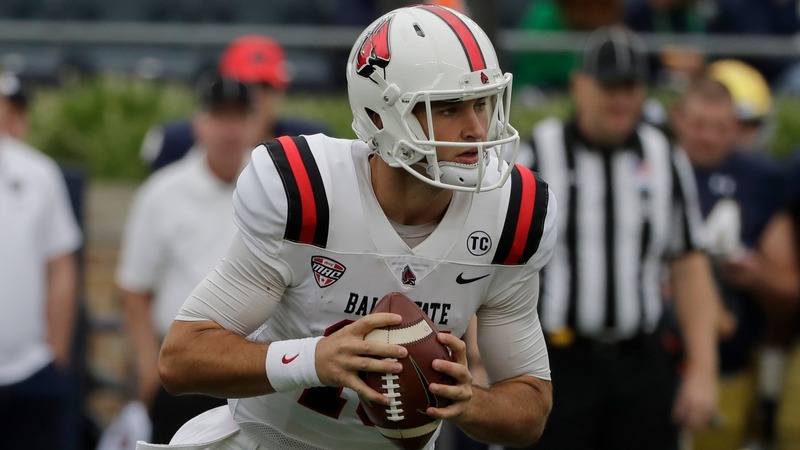 Ball State backup QB Drew Plitt has thrown for 575 yards and two touchdowns in limited action and should be able to break big plays against a Western Michigan unit ranked 123rd in defending explosiveness. The Cardinals best game this season was a 24-16 loss to Notre Dame, since the game the wheels have come off and the coaching staff wants to get a look at younger players for next year. The Mustangs still have a lot to play for and should get the win and cover on Tuesday after a much-needed bye week. ## Western Michigan at Ball State betting lines, odds and pick 5 p.m. CT on ESPN2 __Point spread:__ Western Michigan -8 __Total:__ 57.5 __Line movement:__ The visiting Broncos moved from 7-point favorites to 8 on Tuesday but it has been the total seeing the most action as mentioned above. __S&P+ prediction:__ WMU 35, Ball State 28 ## Western Michigan betting records, stats 2018 SU record: 6-4 2018 ATS record: 3-7 2018 O/U record: 5-5 S&P+ rank: 98 Off. S&P+ rank: 41 Def. S&P+ rank: 108 Special Teams S&P+ rank: 130 __Note:__ S&P+ rankings are an advanced data set of tempo- and opponent-adjusted components of the five factors of college football: Efficiency, explosiveness, field position and finishing drives. Per creator Bill Connelly, a fifth factor, turnovers, is informed marginally by sack rates. ## Ball State betting records, stats 2018 SU record: 3-7 2018 ATS record: 4-6 2018 O/U record: 3-7 S&P+ rank: 119 Off. S&P+ rank: 115 Def. S&P+ rank: 111 Special Teams S&P+ rank: 107 ## Western Michigan at Ball State betting trends Western Michigan is just 1-5 ATS the past six games this season but has won and covered the last three meetings in this series (scores of 54-7, 52-20, and 55-3). Ball State is 2-9 ATS last 11 games in MAC home games and is 8-20 ATS the past five seasons at home. Ball State is 3-11 ATS in its last 14 games following a straight up loss dating back to last season.